In most of Nicaragua, the most abundant and visible of the three primate species is the golden-mantled howler monkey (Alouatta palliata palliata). 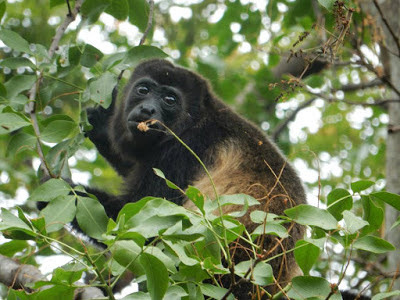 Howler monkeys have always been found in the Laguna de Apoyo Nature Reserve, but their populations have increased dramatically in recent years. 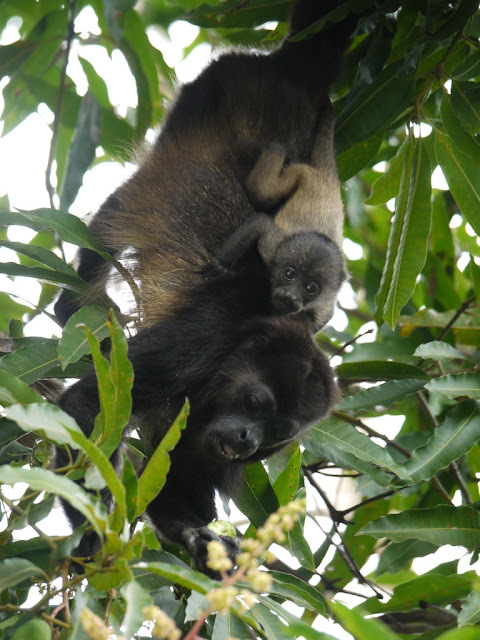 Years ago, howler monkeys were heard from Estación Biológica Laguna de Apoyo, at distances of up to a kilometer to the south. Today, they are within sight at least half the days of the year. This baby howler monkey seems to be holding on to its mother as if on a roller coaster. Photo Jeffrey McCrary. 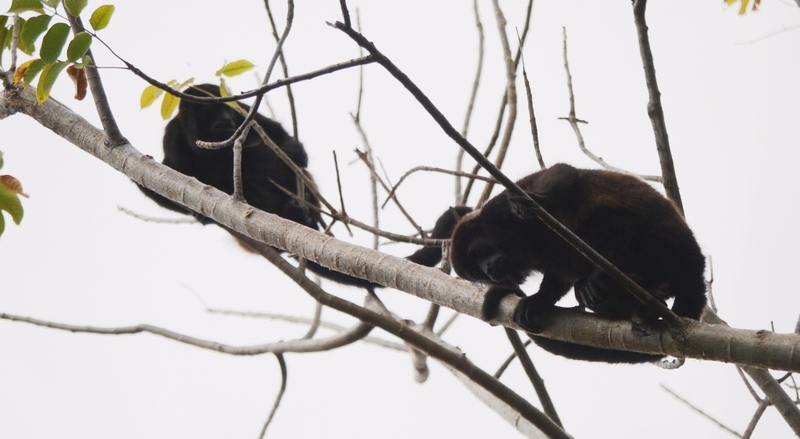 We think this special population of howler monkeys in Laguna de Apoyo Nature Reserve merits a lot of attention. The species is protected by local law from hunting and capture for purposes such as the pet trade, and the populations are very sensitive to habitat destruction. They may never touch ground during their lifetimes, making arboreal connectivity vital to their habitat. In areas where the forest is used for fuelwood, pasture, or other purposes, entire areas may be blocked from access by them. Howler monkey. Photo Jeffrey McCrary. Howler monkeys often are easily seen from the patio of Estación Biológica. Photo Andras Dorgai. The dramatic increases in the howler monkey population in Laguna de Apoyo Nature Reserve has meant that monkeys are found in places and circumstances that present new challenges for coexistence between humans and nature. Most of the homes along the shore now find howler monkeys in their yards many days of the year. The electric wires running through the populated areas present yet another challenge to them. Several electrocutions of monkeys have been documented over the years. What can we do to make monkeys a priority in natural areas? Photo Jeffrey McCrary. 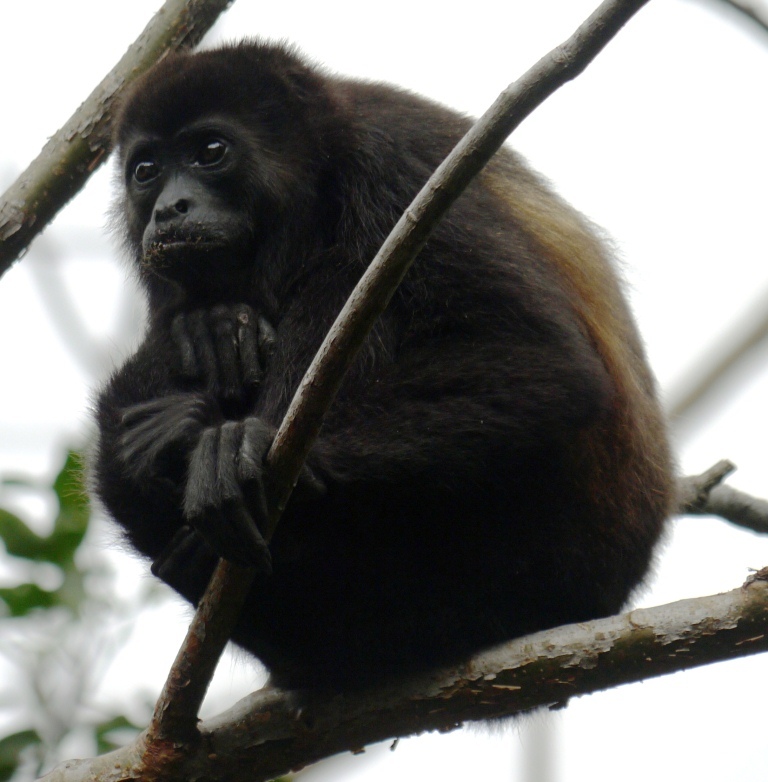 Howler monkeys are classified as folivores, that is, they tend to eat leaves as their sustenance. During the dry season, when leaves are scarce, or old and dry, they may consume larger amounts of fruits. 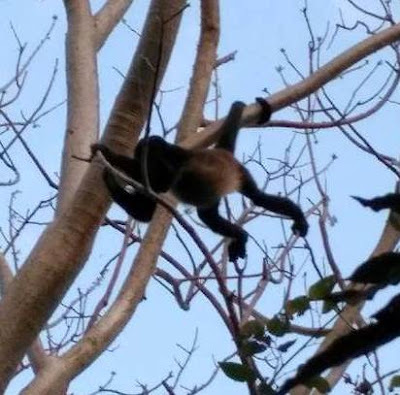 There have been notable occurrences of monkey mortality in other parts of Nicaragua, where the dry season can be quite marked, so monitoring of the monkey populations is quite important. 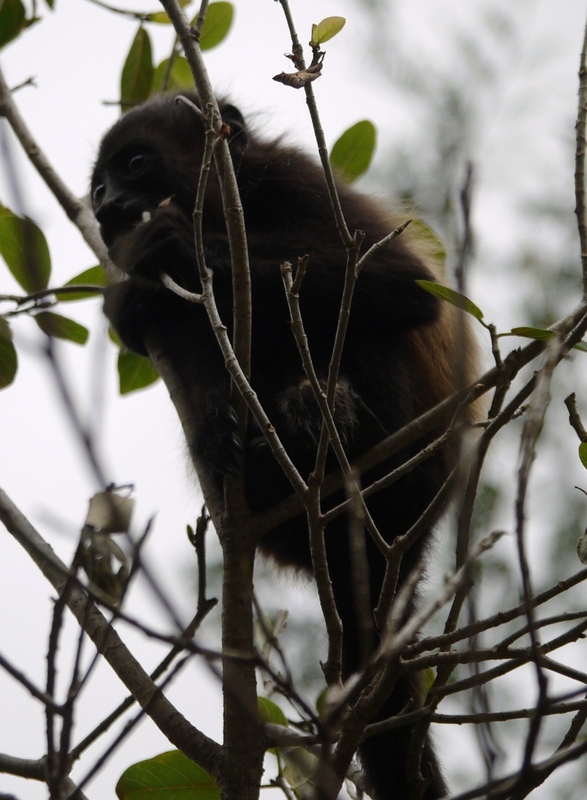 Juvenile golden-mantled howler monkey. Photo Jeffrey McCrary. There are lots of reasons to be studying the monkey populations. One is to ensure that the populations remain abundant and healthy, with adequate numbers of juveniles that reflect a population in constant reproduction. The quality of a healthy environment for monkeys is also important to know and understand. One aspect of a healthy monkey habitat is a selection of trees that provides year-round food in adequate amounts. 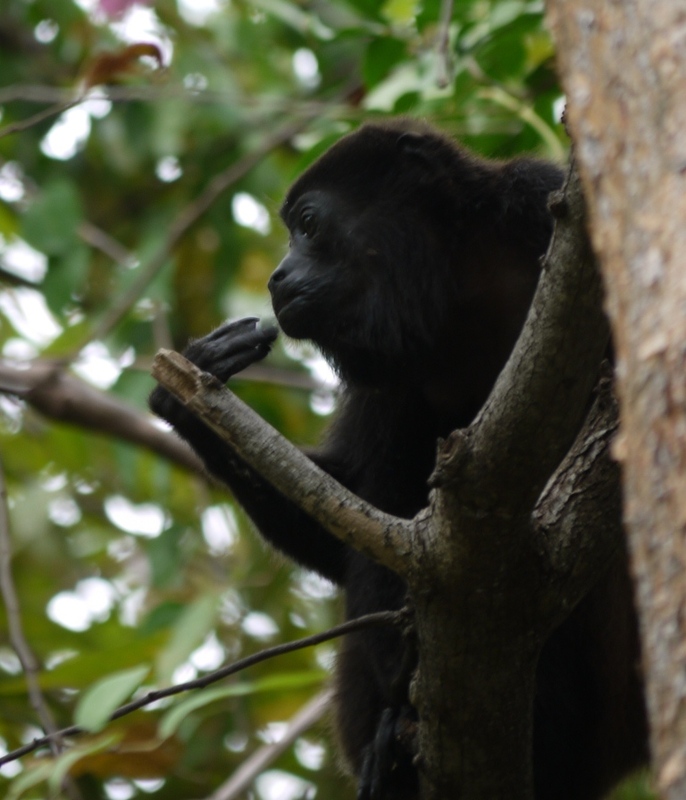 The species of trees preferred as food items by howler monkeys can provide indications for reforestation activities in the area. 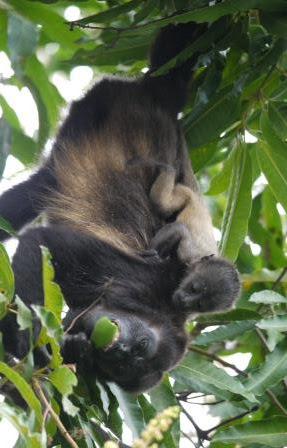 Howler monkeys eat leaves of Bursera simaruba, a locally abundant tree species. Photo Jeffrey McCrary. 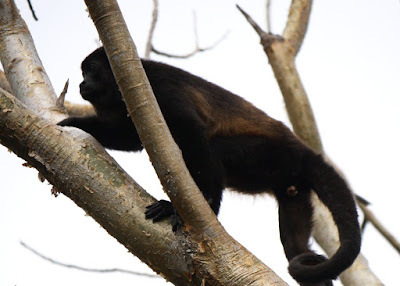 Anyone visiting Laguna de Apoyo Nature Reserve may want to spend some time finding and watching howler monkeys. If one exercises common sense regarding the respect that monkeys deserve, it can be easy to enjoy watching them without causing them any distress. One should remember always that the monkeys deserve to live in peace without any distress caused by humans. 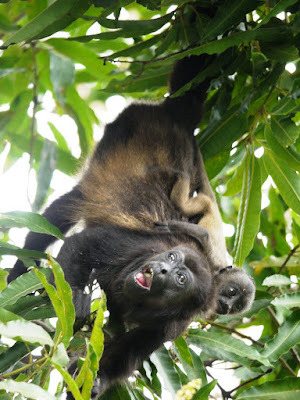 The howler monkeys of Laguna de Apoyo Nature Reserve are easy to find and admire. Watch them with respect. Photo Jeffrey McCrary. When the howler monkeys decide to come to our patio, we are always happy, and we are careful to give them the as much private space as is necessary. They are not here for our entertainment only; they exist for their own reasons, and they should be permitted to come and go as they deem appropriate, without feeling bothered by humans. Baby rides while mother searches for food. In the dry season, monkeys tend to eat more fruits than leaves. Photo Jeffrey McCrary. 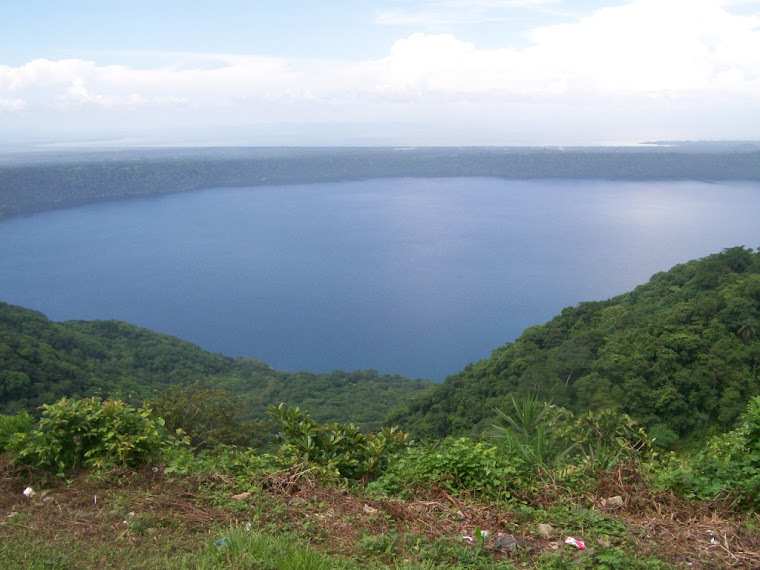 Our concern for wildlife and the habitats they use and require is not shared by everyone, but many people agree that wildlife should receive a greater priority than people in areas designated as wild space such as the Laguna de Apoyo Nature Reserve. There is a growing number of hotels and other spaces where the environment is completely incompatible with wildlife such as howler monkeys. At Estación Biológica Laguna de Apoyo, we stand for wildlife. This baby howler monkey is still breastfeeding. She observes as her mother eats a mango. Photo Jeffrey McCrary. GAIA has conducted surveys and studies of the monkeys and other wildlife in the forests surrounding Laguna de Apoyo. 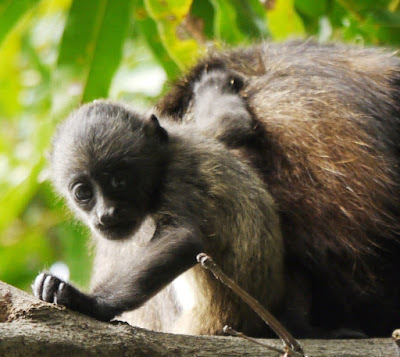 If you are interested in helping to protect monkeys, study them, or just watch them, Laguna de Apoyo Nature Reserve is among the most ideal of locations. A baby monkey watches us as her mother is relaxing. Photo Jeffrey McCrary. Volunteers and interns can arrange stays to help with our conservation projects and to study the relationships between wildlife and the environment in our area. We gladly receive guests and visitors any time, as well. Please come to meet us, discuss what is the latest happening in conservation in the area, and stay as long as you like. An adult female golden-mantled howler monkey scales a tree. Photo Jeffrey McCrary. If you are interested in getting involved in the protection or study of these magnificent animals, please contact us.